This recipe is from Jazzy Vegetarian Classics. Used by permission from Ben Bella Books. 1. Preheat the oven to 325 degrees F. Line a large baking sheet with unbleached parchment paper. 2. Put the flaxseeds in a high-performance blender or grain mill, and process into a very fine flour. Transfer to a small bowl. Stir in the water and whisk vigorously to combine. Let the flaxseed mixture stand for 10 minutes while prepping the rest of the ingredients. 3. Put the coconut, sugar, garbanzo flour, and salt in a large bowl, and stir with a dry whisk to combine. Add the flaxseed mixture, vanilla extract, and nondairy milk, and stir until well blended. 4. For each cookie, drop 1 heaping tablespoonful of the dough onto the lined baking sheet, with a cookie scoop or rounded spoon, spacing them about 1 inch apart. Flatten each macaroon slightly using a flat spatula. Bake for 15 minutes. Decrease the temperature to 300 degrees F and bake for 12 to 15 minutes, or until slightly golden brown. 5. Put the baking sheet on a wire rack. Let the cookies cool on the baking sheet for 5 minutes before transferring to a serving platter to cool completely. Store in an airtight container in the refrigerator, the cookies will keep for 4 days. 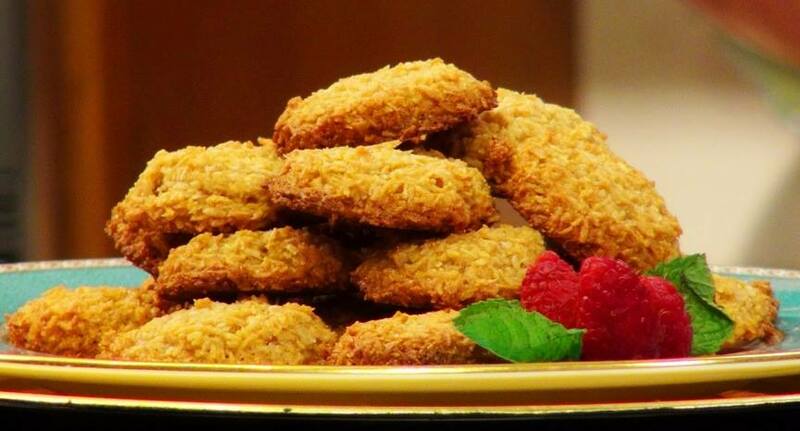 Let us know what you think of this easy vegan recipe: Coconut Vegaroons!